I may not be an expert in German... but I'm pretty sure that would be "flieht, ihr Deppe!" since he spoke in plural. "Fly, you fools! Slap me if I'm wrong. 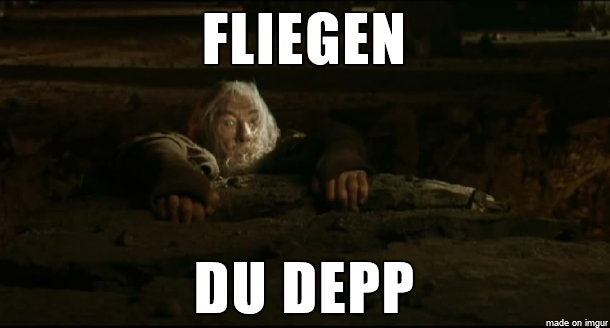 First: it would be "Flieht ihr Deppen"
Second: in the movie he says "Flieht ihr Narren"
Because "Depp" isnt high language but more slang. And "Narr" is high language, which is used in pretty much all movies. Hey, Josh, good to see you back on the forums! Very happy to see Josh posting again and very excited for the weekly/biweekly logs. Anways, after reading Josh's new post for the second time, I have further developed my first impression about the main issue Josh has named FPLT. The so-called "Fundamental Problem of Limit Theory" is no more than the very well known programming dilemma of having to chosse between performance gains and development costs. Therefore, first of all, let's make it clear that the name is slightly incorrect. It is more the "Fundamental Problem of Performance Programming", or FPPP, than FPLT. Josh himself says that "these two interests, as most programmers know, are in oppisition to one another in the world of development. In general you can have one, not both". The only thing I think is wrong in such sentence is the "in general" part. It is not "in general". It's pretty much 100% always, if you think in a per programmer basis. Josh, however, seems to think that he will find a way to escape from having to face one of the most fundamental tradeoffs in programming - which, frankly, is an even more ambitious task than ever. Anyways, let's assume that such break-through is to be ever found. The last 2 years have been spent in trying to find it. It seems that the following months - or year, I would concede - will be also invested in such a quest. Fine by me. The unaviodable question, however, becomes the following. The future final cost of 2-3 years for eventually achieving one of the most dreamed brake-throughs in high-performance run-time programming will be relatively compensated by the future eventual new ease of development? In any case, I know nothing of LT's code specifics, so of course Josh is certainly in a better position to judge. Even if I'm foreseeing the worst, I can only hope for the best and wish Josh the best of luck in his quest. Your wrestling with the seemingly impossible is as entertaining as shiny graphics, gameplay after all provides longevity. Like a sculptor you are chipping away at a seemingly enormous block of marble, each strike of the hammer removing a tiny piece. One day, only Limit Theory will remain. Just be careful as I've seen a lot of these things with the arms missing - strike gently near the elbows. And, as someone who suffers mental issues, I am so pleased that you are still able to work. Talvieno wrote: The whole point was to make Gandalf use slang to yell at Josh. then it would be "rennts ihr deppen"
What people asking for screenshots really want is something tangible they can correlate to the ongoing existence of LT progress. I strongly suspect that *specific* information regarding what work is being done on what elements, as in the second-to-last-paragraph in the "solving the FPLT" section provided, serves this purpose for the majority of people. I wouldn't mind seeing screenies of snippets of codebase which highlight fundamental coding successes or failures, though. kaeroku wrote: What people asking for screenshots really want is something tangible they can correlate to the ongoing existence of LT progress. To me this is exactly *WHY* screenshots are required. Not to show pretties, but to show that there *IS* a current state that most people can relate to. I love the programming updates, and would be happy with simple code snippets. But the general LT public need something visual and tangible. And screenshots, from the current running version, show that there is a current running version. Include the current date/time when you take them, (ideally as an in-game UI element) and it will help alleviate the feeling of no progress. 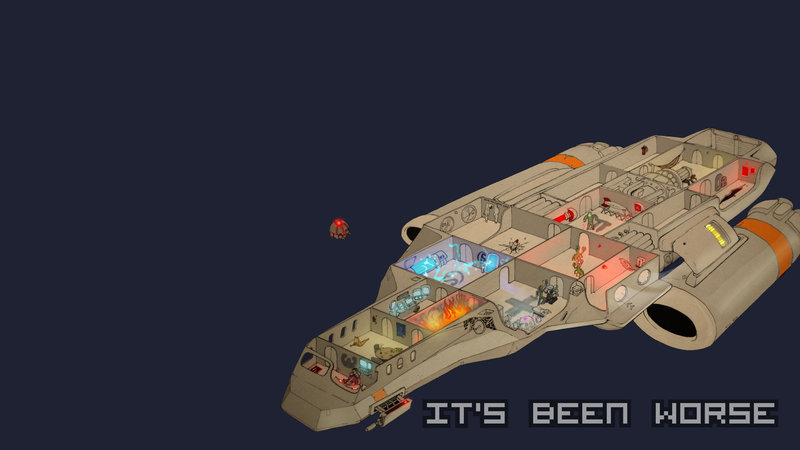 Even if you just show another iteration of a ship from the ship generator, it stills shows people that, yes there is a game, and yes it is progressing and running. A screenshot is fast and easy to both take, and upload (thanks to sites like imgur), so there is no real excuse for not including a single screenshot per weekly update. My suggestion to Josh, take a single screenshot, once a week, of the game if its running, of code if its not. Upload it as part of your Sunday routine for updating us. It doesn't even have to casually relate to your current work. But it's visual proof of something existing, which is harder to fake than simple text-updates, at least in the minds of most/some people. On whether a judicious culling of certain features would reduce the need to wage further bloody war on the performance vs. code complexity front: I think I'd like to hear what Josh has to say on this before I assume that no scope reduction whatsoever is possible. Experienced programmer: splits related features into carefully-aligned libraries with consistent interfaces. It's funny, but like all good jokes there's a kernel of truth to it: time is valuable. Finally, on the "screenies, plz?" question: the fact that so many people today believe that videos are a good way to get information tells me that, if Josh cares at all about promoting LT, he'll take a random screenshot of whatever and include it, with zero accompanying text, in each update post. And that would, for most people, be very satisfying. Perhaps we need a simple program to take several screenshots over the course of each day. The folder of images is then sent to Tal the CM each Friday, who picks a few and publishes them. Zero input needed from Josh, past the installation of the tool, but still human-moderated. If Josh has a big thing, he can send Tal the CM some info on the subject, a draft of the actual weekly blurb, or a simple "I got this" message. 0111narwhalz wrote: Perhaps we need a simple program to take several screenshots over the course of each day. The folder of images is then sent to Tal the CM each Friday, who picks a few and publishes them. Tal doesn't include those shots, easy.